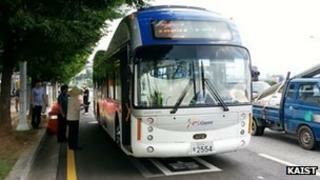 South Korea has switched on a road which can recharge electric vehicles as they drive over it. The project's developer says the 12km (7.5 miles) route is the first of its kind in the world. It means vehicles fitted with compatible equipment do not need to stop to recharge and can also be fitted with smaller than normal batteries. Two public buses are already using the technology and there are plans to add 10 more by 2015. "It's quite remarkable that we succeeded with the OLEV [online electric vehicle] project so that buses are offering public transportation services to passengers," said Dong-Ho Cho, who led the team behind the scheme at Korea Advanced Institute of Science and Technology (KAIST). "This is certainly a turning point for OLEV to become more commercialised and widely accepted for mass transportation." However, another transportation expert warned that the costs involved in installing the equipment meant it was less practical than other schemes which involved vehicles wirelessly charging at specific locations or using overhead cables. "There is clearly a lot of potential for this technology for public transport applications, but for private electric vehicles the cost of fitting all roads with such systems may be prohibitive," said Dr Paul Nieuwenhuis from the Centre for Automotive Industry Research at Cardiff University. The Korean project runs from the train station in the town of Gumi, in the south of the country, to the In-dong district. A device fitted to the bottom of the buses receives power from the road using a technology called Shaped Magnetic Field In Resonance. Electric cables installed under the road are used to generate electromagnetic fields which are picked up by a coil inside the device and converted into electricity. The receiving equipment can be up to 17cm (6.7in) above the road's surface. The researchers say they can transfer 20 kHz and 100 kW (136 horsepower) electricity at up to an 85% maximum power transmission efficiency rate. They say that the power strips involved only need to be placed under 5% to 15% of the road, meaning that only certain sections need to be dug up and replaced. They add that because vehicles do not need to stock up on energy before making their journey, the batteries involved can be three times smaller than would otherwise be needed. This reduces the weight of the vehicles helping reduce the amount of carbon dioxide emitted when generating the power required. Although the OLEV project is the first working scheme to power vehicles on the move, there are other inductive charging projects elsewhere. Torino, Italy and Utrecht, the Netherlands have also fitted wireless charging equipment to some of their bus stops to allow the vehicles to top up power while drivers take short breaks. Engineering firms Arup and Mitsui have set up a joint venture to roll out a similar scheme in Milton Keynes this autumn. Utah State University is also testing a prototype campus bus which it says can achieve greater than 90% power transmission efficiency with a distance of 6in (15cm) between the pick-up coil and road surface at certain stops. There are also moves to transfer the concept to cars. In London, computer chip maker Qualcomm is testing a wireless charging tech it calls Halo which it has fitted to Citroen and Rolls Royce vehicles, but again the idea is only to install power transmission pads at certain spots. One expert said it was likely to be a long time before South Korea's more ambitious design became commonplace. "I think we are decades away from even thinking about a nationwide network of electrified roads," said Ashvin Chotai, managing director of the Intelligence Automotive Asia consultancy. "For now, it appears to be more of a showcase technology than something which has the potential to be commercialised."